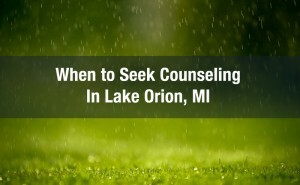 Seeking counseling in Lake Orion MI shouldn’t be stressful. When to seek counseling is an incredibly personal decision, and one that takes many people through an emotional rollercoaster. 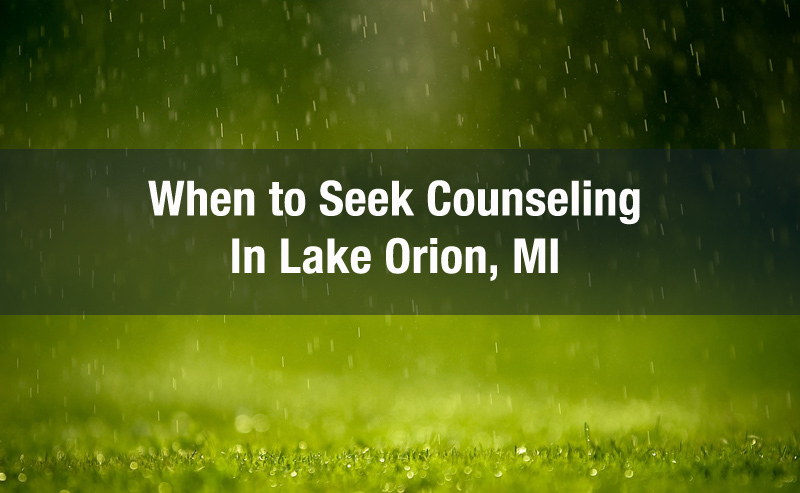 Seeking out counseling in Lake Orion shouldn’t be stressful, and there’s no shame in finding help. Counseling, in many ways, should be considered as an early option to address challenges in life, as well as to take a proactive stance to keeping relationships healthy and tending to your well-being. Persistent feelings of hopelessness, despair, loss of interest or anxiety lasting more than two weeks can be indicative of clinical depression. Counseling for depression is strongly recommended in this case, and can help you understand the causes of your depression and develop strategies to help you move beyond the depression. Anxiety that affects your ability to function either at work or socially, and is either increasing in frequency or has lasted for at least six months. Panic attacks are also strong indicators that professional help would benefit you. When you see a psychologist for anxiety, they will use multiple modalities to address the causes of your anxiety and advise a course of action to help you overcome it. Debilitating or persistent negative feelings after trauma. Traumatic events can lead to post traumatic stress disorder (PTSD), which is best handled by a professional. At our practice, we have experts in PTSD treatment available. A desire to improve communication. If you’ve wanted to have a deeper, more loving, openly communicative relationship, therapy is a great choice. Marriage and couples counseling isn’t just for individuals who are experiencing problems- it’s for couples who want to invest in the health and happiness of their relationship. Marriage counseling is an amazing way to strengthen the bonds of your relationship by opening lines of communication and exploring each others needs. Before problems arise, consider couples counseling. Family counseling is another great choice to increase positive feelings and strengthen the relationships within your family. Suspected mood disorders. If you had a parent or sibling with bipolar disorder or schizophrenia and you have some of the symptoms of a mood disorder, making a counselor a part of your health team is a wise choice. Look for symptoms like paranoia, extreme fixations, and dramatic unpredictable mood swings. If any of those are present, it’s time to seek professional help to gain a true diagnosis and a structured treatment plan. Substance abuse or addiction. If you or a loved one are suffering from addiction, seek help immediately. We’ve seen a dramatic increase in opioid related deaths in Oakland County, and the dangers of drug overdose should be taken seriously. Look for signs of persistent irritability, mood swings, changes in weight or eating habits, substance abuse, insomnia or oversleeping, denial, and other mental health imbalances or personality changes in assessing whether counseling may be beneficial. Don’t be afraid of stigma. Sometimes having mental health issues can come with shame and a stigma. Remember that every one has difficult periods and there is no shame in needing to ask for help. Listen to your gut. You know yourself better than anyone. If you feel like something is off, even with no explanation, don’t hesitate to follow that instinct in seeking help.